While there are many ways to enjoy a cup of tea around the world, perhaps none is more famous than a proper cup of English tea. It’s no secret that the British love their tea and throughout both history and in recent years, tea has played a large role in the British culture as well as their everyday life. Despite their reputation as tea drinkers, the way in which you make English tea is far from common knowledge for the average tea drinker. At Finest English Tea, we respect the tradition of English tea and have outlined the steps for how to make a proper “cuppa” English Tea for yourself at home. Keep in mind that English tea is far stronger than most American varieties containing more bitterness and caffeine. Some of the more classic varieties include Earl Grey and Breakfast Tea. You will also need to determine whether you will use loose leaf or tea bags as this will also determine the teaware required to make English tea. Be sure to always use fresh water in your kettle for each individual tea steeping. The quality of water you use will have an impact on the overall taste of your tea so you don’t want to use tea that was simply left in the kettle. Boil the water to at least 200 degrees F in your electric kettle, stovetop kettle, pot or microwave if you’re in a pinch. While you wait for your water to come to a boil, it’s time to begin preparing your tea and your teaware. If you’re using loose leaf tea, the rule of thumb is 1 teaspoon of tea per cup in addition to one extra teaspoon for the pot itself. So if you have a 3 cup teapot, you would use 4 teaspoons of high quality tea in your brew. Loose leaf tea is also often steeped from within a diffuser to maintain quality. More commonly however, teabags and mugs are used when making everyday English tea rather than cups and saucers like many would assume. In this instance, you would use one teabag per mug. Or, if you’re hosting a larger group, a teapot is the preferred method in which the tea ratio would be 1 teabag per person. Once your water has reached the boiling point, remove the water from the heat and prepare to pour it into your receptacle. It is imperative that your water is boiling in order to fully release the flavors of the tea. Slowly pour the water and when you teaware is nearly full, give the tea a good stir to infuse all of the tea leaves in the boiling water. A good cup of tea requires time for the flavor to fully develop. Typically a minute or two is all it takes for a cup of tea, while a pot requires at least 3-5 minutes for the steeping process to finish. Next remove the teabag from your cup or teapot and throw it away. Used tea is also a great addition to your compost bin. Remember to never squeeze the tea bag as this can release added bitterness and cause unwanted flavors to enter your tea. 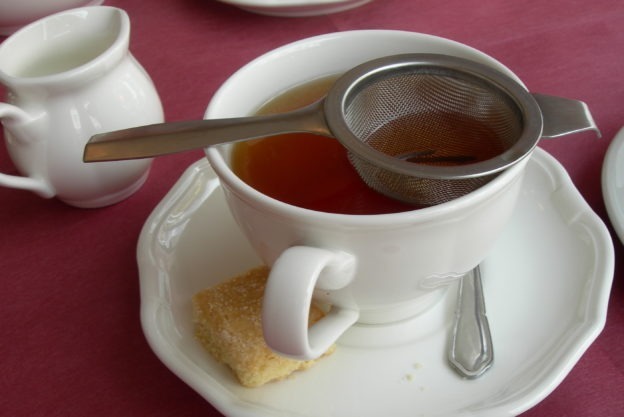 Because of the strength and bitterness of English Tea, milk or sugar are commonly used to dilute and enhance the tea’s overall flavor. The key to adding the right amount of milk to your tea is hidden in the color. The perfect cup will have a dark brown-orange hue not dissimilar to that of an American coffee. Once stirred, the tea should be nearing the perfect temperature to drink. Another staple of English tea has nothing to do with tea at all. Biscuits, cakes, crumpets and other pastries are often served alongside tea in England especially when enjoying the tea with the company of friends or family. At this point there is only one step left to complete your lesson in the perfect cup of English tea — Sip and Enjoy! If you have any other questions about how to make English Tea, don’t hesitate to contact us! This entry was posted in Tea on 06/08/2017 by Adam Rosenthal. Stopped reading at the word “microwave”. You should feel shame.